Intel could dump Nvidia for a licensing deal with AMD as the chip giant tries to prop up its patent portfolio. Currently, Intel is under a $1.5 billion licensing agreement with Nvidia, which the two companies signed in 2011. At the time, the two companies had spent years fighting each other in courts over patent licensing, and the agreement put all that litigation to rest. What does all this mean for consumers? Potentially, not much. Intel’s current licensing deal with Nvidia never translated to any sort of Nvidia-branded technology in Intel chips. At best, the biggest impact for consumers is that the two companies didn’t waste more time and energy trying to sue each other into oblivion. Having said that, Intel and AMD have been playing nice together lately. 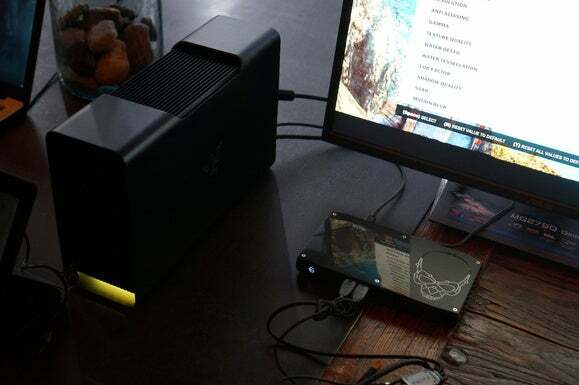 Both companies were part of a collaboration with Razer on the Razer Core GPU dock, which provides gaming muscle to laptops or low-powered desktops through a Thunderbolt 3 connection. During a press event, Intel even used an AMD graphics card to demonstrate how the dock works with its upcoming Skull Canyon NUC mini-PC. As ExtremeTech notes, Intel has also indicated that it will support AMD’s FreeSync standard for variable refresh monitors, rather than licensing Nvidia’s rival G-Sync technology. It’s also worth noting that AMD recently spun off its GPU business into a separate group that covers software, hardware, and intellectual property. Just to speculate, this could pave the way for AMD to more directly integrate its graphics innovations into other companies’ chips—including Intel’s. Why this matters: Given AMD’s experience with integrating CPUs and GPUs on the same die, it’s intriguing to think of what a licensing deal with Intel might bring, especially with Intel leading the mini-PC invasion. But this is just a rumor for now, and even if it comes to fruition, the result could be nothing other than more favorable licensing terms than what Intel gets through Nvidia now. At most, it’s a development worth watching.